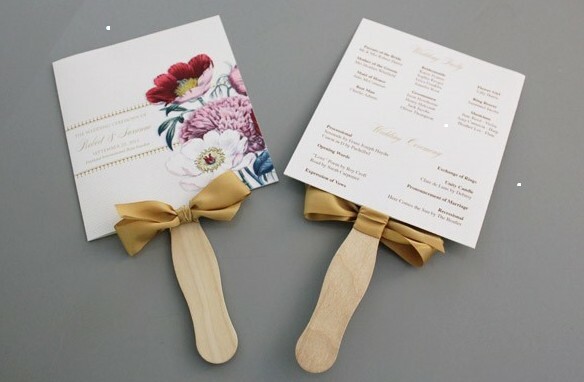 Keep guests cool and at the same time informed about the program by turning your wedding programs into paddle fans! Follow the tutorial on the source to create this idea. See a variety of templates for fan shapes. See a tutorial for making heart-shaped fans. See a tutorial for this idea with a puzzle on the back of the program and a pencil attached to the fan handle. See a tutorial for this idea with a wood fan background. See this idea with a doily on one side of the fan.